I’m sorry it took me so long to get round to City of Stairs, because it turns out that the buzz on Twitter and the recommendations from other bloggers were absolutely right. It’s maintaining a high rating on Goodreads (4.20, with 8,000 ish reviews, at the time of writing), and for good reason. It’s really awesome. Now, if I’m honest, it did take some time to settle down, and to figure out who was going to be the protagonist. There’s a lot to learn about the world: the dos and don’ts, the past, the present, who and what we’re rooting for… Some details only become apparent as the book goes through its twists and turns. Some obvious things are avoided: loyalties can be mixed, long-held understandings overturned. But even some Golden Age crime fiction satisfyingly flouted those laws — Agatha Christie bent the rules significantly with The Murder of Roger Ackroyd, for example — and there’s no reason we have to stick to it. 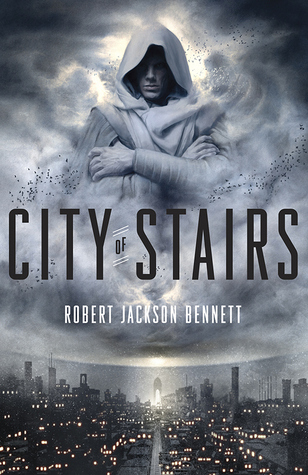 Fantasy often lets us see familiar things anew: I don’t see why not mystery, espionage, politics, bureaucracy… all of which play a part in City of Stairs. And if the commentary on empire still stings and conjures up spectres and parallels, as it seems to, well, it should. Which is not saying very much about the book. Once I was into it, it was a page turner: I wanted to know, needed to know. Once the focus became clear, so did the characters: Shara, Sigrud, Mulaghesh… with their flaws, their pasts, their hopes for the future. Shara, particularly, with her knowledge of the past, with her interest in it, paired with a duty to suppress any recognition of it. Granted, at times her knowledge is very encyclopaedically convenient, but I do suspect that if she were a male character, people wouldn’t be complaining of that. She doesn’t always make the right decisions: she just makes some pretty good ones, based on her experience and knowledge. The story tells you she’s good, and then she shows us it, and… people don’t want to believe it because she’s a woman? Ugh. I love the background to the world, too: the history, the rules of the way the gods work and the intertwined nature of their relationship with their adherents. I’m excited to read City of Blades, though I don’t know anything yet about where it’s set, or even what the blurb says. I’m happy just to plunge straight into it on the strength of City of Stairs. Oooh, I will definitely have to pick this up. Yeah, I’ve kind of caught up with my backlog of reviews, haha! I really need to read more or slow down my posting schedule for a while. I’m really excited for the next book. This sounds like a great book, and I absolutely adore the cover. You can totally have mystery set in a fantasy setting. It’s so small-minded of some people to think they can’t! I really, really enjoyed it, I do recommend it! And I’m told the next book is even better.